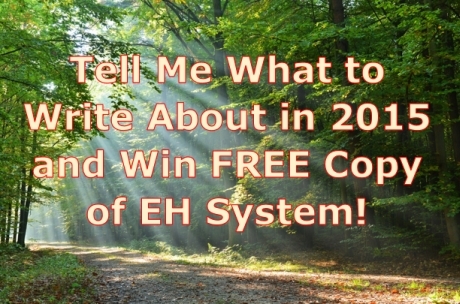 Tell Me What to Write About in 2015 and Win FREE Copy of EH System! Here’s the deal – if YOU suggest a GREAT topic for me to cover on my blog in 2015, you’ll automatically enter a draw for a chance to win one of 3 FREE copies of the English Harmony System – and I’ll do the draw LIVE in front of a camera. In order to do it, you have to post your suggestion in the COMMENTS SECTION BELOW this article – as soon as you do it, I’ll write your name on a piece of paper and enter into the draw box! Now, the topic you would suggest me to write about next year has to be related to English FLUENCY development and please bear in mind it’s NOT about me answering SIMPLE English grammar related questions. Robby, I’ve bought plenty of English grammar books and I’ve become quite good at filling gaps into the exercises. When I’m trying to speak however, I’m not so good at it, so could you please write about how to use various English textbooks such as the Cambridge series in order to develop the ability to speak fluently? So, as you can see, the person asking this question is facing a specific issue – they have plenty of English textbooks and they want to know how to use them best in order to develop ability to speak more fluently. So for as long as your question is about anything English fluency related – speech anxiety happening for no apparent reason, inability to speak at a particular event, difficulties speaking at work, struggling to memorize new English vocabulary, finding it difficult to respond to people’s questions – you get the drift! – your question is going to be considered a contender for the draw. I’m finding it difficult to use the Past Perfect Tense in my speech, so maybe it’s best not to use it and just stick with the Simple Past? If I try to use the Past Perfect Tense, I just can’t speak fluently because I’m thinking too much! But please don’t ask simple grammar questions such as “How to use the word “to be” in English?” because – just like I already said – my blog’s main focus is on the fluency aspect and that’s the way I’d like to keep it! Publish your suggestion for an article or a video for me to cover in 2015 in the comments section below, and you’ll automatically enter the draw! ah thanks a lot Robby, I will go there to read and learn. Hi Juhapekka, I just wanted to let you know there’s an interview available here on my blog: http://englishharmony.com/toefl/ where I’m discussing the TOEFL test and I’m also touching upon the grammar aspect of it – you’ll definitely find it interesting! I hope you’ll enjoy reading this article and thanks for your suggestion! No problem! I’m glad that your name was drawn and thanks for the good wishes! Now, in order to proceed with issuing the program access details, please contact me at support@englishharmony.com and we’ll take it from there! Thank you Robby! I was extremely happy to see my name among the winners and it’s not about the prize, it’s about the winning. Don’t get me wrong – I really appreciate the prize but the simple act to win something is so inspiring. That will raise my confidence, but confidence is very important to speak fluently, isn’t it? So I think you’ll help me twice – first with my self-relience and second with the valuable knowledge in the English Harmony System. Thank you, once again, and have inspiring 2015! And congratulations with winning a free copy of the EH System! Please get in touch with me at support@englishharmony.com in order to obtain all the necessary details so that you can start using the product. You’re one of the 3 lucky people having won a copy of the EH System, so please get in touch with me at support@englishharmony.com in order to obtain all the necessary details so that you can start using the product. Congrats Shamil with winning the draw, and I’m convinced you’re going to benefit greatly from the EH System – believe me! So, please get in touch with me at support@englishharmony.com in order to obtain all the necessary details so that you can start using the product. Hi Saddy, the video is published on YouTube: https://www.youtube.com/watch?v=5iPXbzmfB-0 and I’m going to publish it on my blog later on! I have been scouring the EH blog for the video showing how the draw was made without any success. Could you assist me on where can I see the said video? I never won anything in my life. And when I saw the last name from the draw was mine I was like, No way I won this! Then I watched the drawing part again and there it was my name on the paper. So it’s a great feeling to win something in the life. Plus to win English Harmony system, it’s the best present ever for English learner. I am positive that I will reach the new level of English with EH system. Thanks Saddy for the submission! Yours is the last one considered for the draw; soon enough I’m going to make the video where everyone is going to be able to see the draw happening! To the best of my knowledge, Fluency disorders such as Neurogenic disfluency, mixed fluency failure, Stuttering and psychogenic disfluency may hamper FLUENCY PROFICIENCY and EFFECTIVE COMMUNICATION when it comes to communicating in english or any other language. Could you please write on fluency disorders, expressing the best ways being BEHAVIURAL or otherwise to mitigate their impact on english fluency development. I do occasionally face the same issue when it comes to speaking in english or my native language. But it is quite tense when I speak in english. I will be grateful if this issue will taken into consideration in 2015 list of topics to be covered. Perfect topic, thanks for the suggestion, now you’re a participant of the draw! Thanks for your suggestion, that’s a very valid question indeed! Your name has gone into the draw box! , and with this exercise he/she would satisfy to himself/herself. Thanks a lot for the submission! Thanks Renmark for the suggestion, now you’re a participant of the draw as well! Thanks Nick, I’ll definitely look at one or two of these topics next year, and I’m adding your name to others in the draw box! you should write the discussion about corporate or enterprise employees who use engilsh as a communicaton which is a major tool to attain thier career objectives.. there are people have good vocabulry ,grammer but not able to present propoerly goes on. It’s possible to find your opinions and hints concerning practically any aspect of English learning among your several hundreds of articles and videos. May be it’s the time for you to look at the world and life more widely and to share your thoughts with us. 6) Which political system would be the best in XXI century ? And so on …. You can name it. Would this article answer your question: http://englishharmony.com/english-learning-for-beginners/ ? As for the “Project writing skills” topic – sounds like a good one, thanks, your name has gone into the draw box! I will, however, create another entry on this blog dedicated to this topic you suggested, so thanks a lot and needless to say – now you’re part of the draw as well! It’s a really great topic – I just looked up “Critical Pedagogy” and it turns out it’s something that deeply resonates with the English Harmony learning philosophy! Your name is in the draw box! While I appreciate your suggestion, I have to decline your submission simply because it’s got nothing to do with the English language. You have told previously your personal story about your english learning, your issue with spoken fluency and so on. Mostly of us used to use the grammar-translation method in the beginning as well. It would be so interesting to know what you would like to advice for very beginners who live in non english speaking country now. What way to mastery of english could you recommend for them? Usually, all gurus like talking about what we should do since an intermediate level on. But everybody hold back from answering where people with the intermediate level of language appear from. English speaker speaks in English they have facial expressions. Commonly made errors as well. Here in India people make blunders. Make mistake: they say commit mistake or do mistake. hi robby.. you should write about confidence while initiate the talk. to do this one should attain inner peace through meditaion. this not only for the English language but to be a good harmony relationship for different religious follower and for human being. voicing them I mumble. How to overcome that problem? I want to suggest that abolition of terrorism and spread of peace is good for writing as it is need of the hour. I didnot know about any other…..it is just my own opinion…. I’ve written about a similar topic: http://englishharmony.com/practice-spoken-english/ but I haven’t touched upon the one you just suggested – so I’ll definitely write about it next year! Thanks Camille for the topic, I’ll definitely write about it! Needless to say, you’re participating in the draw now as well. Thanks Juhapekka, as you rightly pointed out, I’ve touched upon all the related issues but I haven’t clearly defined this problem, so I’m definitely going to do it! You’re in the draw now! psychological factors such as the fear of failing and making mistakes. Therefore, if we learn to accept mistakes as part of the learning process, we may unlock ourselves and start speaking better. and a bit time-consuming project to write about them but I’m eager to find out what is your present opinion on the role of grammar studying in them and what kind of grammar studying you have to do or is simply memorizing natural speech patterns and natural collocations enough which I’m sceptical because there are many tricky grammar and vocabulary questions in those exams and memorizing the sufficient amount of speech patterns and natural correct collocations without acquiring colloquialisms and commonly used wrong grammar structures (possible even among native English speakers) which are perceived as mistakes in the exams is very challenging and it takes maybe too much time. And you have to also memorize them sufficiently well so that you develop the gut feeling about what is wrong and what is right but the problem is that this process takes a huge amount of time if you want to get the best possible scores in Cambridge English: Proficiency (CPE) which is the most difficult Cambridge exam according to their website http://www.cambridgeenglish.org/exams/proficiency/ . I really don’t have any kind of clue how difficult this exam is comparing to other exams like IELTS or TOEFL but this is just an example and you get the drift. And only getting the best scores in those tests by using traditional methods counts for nearly nothing in real life if you can’t use that knowledge in real professional situations and you can’t talk properly and naturally with ordinary people. That’s why those kind of tests can be a real double-edged sword. simple truth but I have started to believe it’s one of the biggest reasons behind my and others’ speech anxiety and confidence problems. I could have said this before but it’s so damn simple that I didn’t realize it. I wasn’t sure how to put these thoughts into words but I hope you get the drift well. And thanks Robby for asking the topics! Hi Robby! I listen to English songs a lot but I’ve noticed that I don’t understand half the words that I hear most of the time. I always have to look up the lyrics in order to understand the song. I have peers who are fluent in English and they could clearly distinguish the words in one go. What’s the reason behind this? Thanks Robby! Hi Robby! Could you cover in your video how to easily find a native English speaker, I am living in non-English speaking country, to practice with for free? And how to approach him or her without being annoying? Should I have some plan of questions to ask? I need natives to see how my pronunciation is, if my English comprehension on a good level and so on. I registered on many English learning websites in order to find a speaking partner, but they are crowded with non-natives and fewer natives. And other options are not for free so they are out of the question. Thanks for the topic suggestion Hector, I really appreciate it! Speaking of a course – there’s no reason why I couldn’t work with total beginners on my Skype-based program called Fluency Star http://fluencystar.com/ When it re-opens next year, I might actually include an option for beginner English learners there! Thanks for the question Rumyana, it’s a good one! I’m definitely going to touch upon it next year – and needless to say you’re now participating in the draw! I’m sure it will shed some light on the issue! That’s a very valid question Sergey, thanks for asking! And thanks so much for the nice New Year’s wishes – Many Happy Returns to you and your family! Your name has now officially gone into the draw! You’re damn right about it David. I’ve made similar observations during my Fluency Star Skype sessions and I’ll definitely touch upon this subject in the article! This is definitely a great topic, thanks!!! Your name is gone into the draw box for the draw! I update it regularly and it’s got a good few phrases in it that can be used in all sorts of social situations! Sorry Kanaga, did you mean how to write a CV? I’ve already published an article on how to use the simple verb “to get” – now I’m going to do another one about “to make” as per your request. Thanks Abhik for the suggestion, now you have a chance to win the EH System! You mean making videos such as these? Fair enough, I’ll do more of them next year! Thanks for your submission, your name is in the draw box! Perfect suggestion, I’ll definitely cover doing various tests in the early stages of 2015! Your name is included in the draw! Believe it or not, but you can find this EXACT type of content in my products – both EH system http://englishharmony.com/improve-spoken-english.php and Accent Genie program http://accentgenie.com/ consist of 120 videos total which are stuffed with phrases and sentences covering all imaginable life situations! Hi Robby. I suggest that you write some articles about “How to remember phrasal verbs without mixing them up” using, let say, the 100 most frequently used phrasal verbs. Thank you very much in advance! I would like to suggest to do about 60 short videos talking alone or with another persons about different matters covering a lot of situations of real life, with transcripts in english, without translations. The themes can be about a lot of different questions so students will be interested in many of them, improving the prounciation and increasing their vocabulary with new phrases. That’s an interesting topic Fab – should learning be ‘fun’? Should it *always* be fun..? I was thinking about it this week. I had a new student, and after our first lesson I thought to myself: “Hmm, that wasn’t really fun..” I then wondered what she thought. However, and this is the kicker – what we did was some really good practice of pronunciation. For the first time ever a teacher told her how we link words together (eg “I had a nice day” – had, nice and day will be stressed, while the smaller words are linked in with the bigger words, so it all flows nicely). As a learner, I have a new dance teacher, and it’s not traditionally ‘fun’. He’s really serious. But after 5 or so lessons with him, I’m already dancing better. Most teachers and learners will say they want ‘fun’ but if someone is damn serious about learning, they will overlook this if they can then see their progress. Hi Robby, you ‘ve suggested that we can improve fluency by stopping trying to remember the exact word and saying something even it sounds incorrect, silly and stupid. For example, we can forget about grammar in some specific situations when you don’t want to put your brain into overdrive trying to remember the exact grammar construct. I totally agree with you. However, as international English tests like TOEFL or IELTS have become more crucial that many people, including me, consider it as the target when we learn English, I think you should mention it in your blog in 2015. These tests have discrete Speaking part and because they design specifically for academic purpose, the examiners must ensure fluency as well as grammatical accuracy (they are both included as criteria for marking). So can you tell us how to deal with these tests, which books to use, how to brainstorm when we have to present about a given topic, how to speak more complicated sentences to raise our scores or just generally about what you think about these tests? learn? Or any offer ? Software ? Website or course? Hello Robby, I’m quite fluent with non-native English speakers, but when it comes to communicating with natives – it’s quite hard for me. The question is – why it is far more easy to find the words and expressions when there is a non- native in front of you and are you really fluent if you cannot communicate with the natives on the same level? Thank you in advance. Robby, I’d been studying english by myself, using CD,mp3-downloa and podcasts, but I have a great problem in a conversation I can’t understand because I tried to translate into my own language word by word. How can an adult avoid it? Hi Robby! The topic I could suggest is about pronunciation, an accent. I know you’re not a native speaker, but your English is excellent in my opinion. Believe me I don’t flatter you, I know what I say. I used to be a pilot of the cargo plane, AN-12, (I’m sure you know that aircraft). Where was I? Yes, the pilots and air-controllers speaked very different English, I could surely recognise who was speaking: German, Arab or Chinese or someone else..My English was very feeble that times but I remember it! We were laughing about how some pilots were speaking(air-phraseology is pretty standart). Now I understand how we were silly and young, maybe our English was weird, who knows? Therefore, my question and suggestion to reveal this theme is: how to avoid the ridiculous sound in non-native language? I bet you know the answer. You’re originally from Baltica and you know that people from there speak Russian in my country very well but with a light accent and the accent is pleasant and charming(especially your women!). From another hand, some people sound weird and rediculous, as father to the South. To make this story shorter, I’d like to hear what you think about it. Hope you explain it in your next lessons. Please excuse my grammar, I’m not good at it and this problem doesn’t bother me at all (your tip, by the by, thanks). I just want to improve my speaking and listening skills. My good wishes to you and yours in 2015, Robby! “A Business has to be involving, has to be fun, has to exercise your creative instincts!” by Richard Branson. Hence, the faster way to learn English effectively should be a learning system which is involving, fun and creative at the same time!! Obviously in all 4 skills!! I would like to read about english( phrases) which can be used in a social situations ( I mean small talk) . I can admit that I am quite fluent in English speaking environment at my work but sometimes I am quite confused about natural behaving and speaking during social events . It would be interesting to read something about this . Hi robby.. I m very proud to say that u also a reason for i m typing in english.. thank you so much .. pls write a topic abt how to write a Biography.. once again thank you soooooooooo much ..
hello robby, i hv seen most of hollywood movies..but without english subtitle its become quite difficult..from movie and serials i have come to the topic about use of make and get..e.g.” i wanna make him to do for me”..how we use it in speech..i tried but..i can only speak simple english.. I would like you to write an article or make a video about Effect of informal Spoken English in writing and Correction of this flaw. This may be also called “Creating a Bar between Written & Spoken English”. I would like to suggest talking about different usage of common verbs and phrasal verbs in particular.